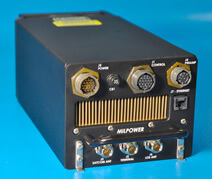 Milpower has developed the 37000-2 amplifier compatible with the PRC-155 series of radios. This 290-320 MHz (30-960 MHz in bypass mode) ATR amplifier also contains an Ethernet interface and complete, tested compatibility with the MUOS waveform per the MUOS-Specific Terminal Services (MTS) Specification Rev. F (P/N 37000-2). 13.9" L X 5.99" W X 4.7" H, 14.9 lb.